You can access this section by clicking Memory modules manager, in the Home section. This section allows you to detect and delete infected memory objects. The list shows all running processes in a treeview control. Each process is a branch of the tree. To list the modules loaded by a process, click the + button to the left of the process line, or just double-click the line. The branch will be expanded. You can choose to hide the system protected files, all Microsoft files, or all signed files from the list by clicking the List settings button. Select the radio button corresponding to the desired option. If you select Show all modules, then all the modules will be shown. However, you will not be able to delete or rename system protected files using UVK. If you select Hide system protected files (Default), then only the non protected modules will be displayed. If you select Hide all Microsoft files, then no Microsoft files will be shown. If you select Hide all digitally signed files, then UVK will verify the digital of all files and display only the unsigned ones. All the processes will be shown, no matter which option you choose. The filter applies only to the modules loaded by the processes. 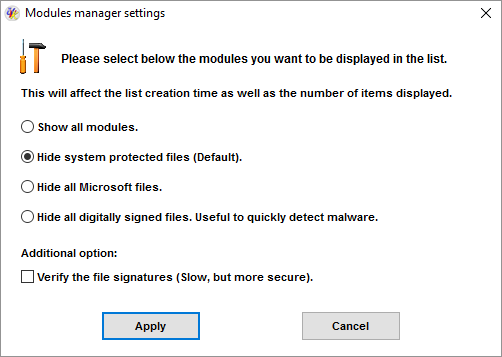 If you use the second or third option, and you suspect that the system or Microsoft files have been infected or replaced, check the aditional option Verify the file signatures. This will ensure only genuine files are hidden from the list. Once you have selected the module you want to analyze, right click its line to get a list of options you can select to get more info on the modules, and delete it, if desired. Click Module properties in the upper pane or in the context menu, or double-click the module's line to get more info on the selected file. UVK will display an information dialog box similar to the picture below. Note that the file chosen for this example is not an infected file. Click the Go button, in the Process path line to jump to the corresponding process file location. Click the Go button, in the Module path line to jump to the selected module file location. Click the Google button, in the File description line to perform a quick google search using the selected module's file description as the keywords. Click VirusTotal report to get a VT report of the selected module. 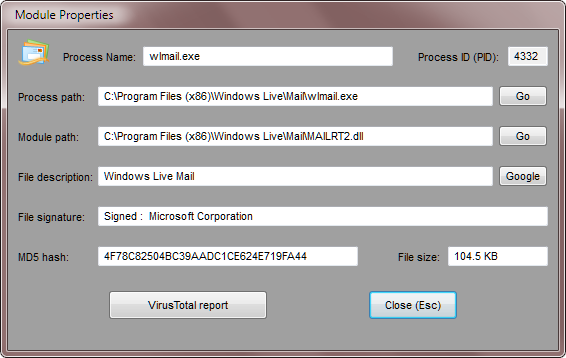 To get more info about the VirusTotal analysis, click here. Click Close (Esc) to close the info dialog box. 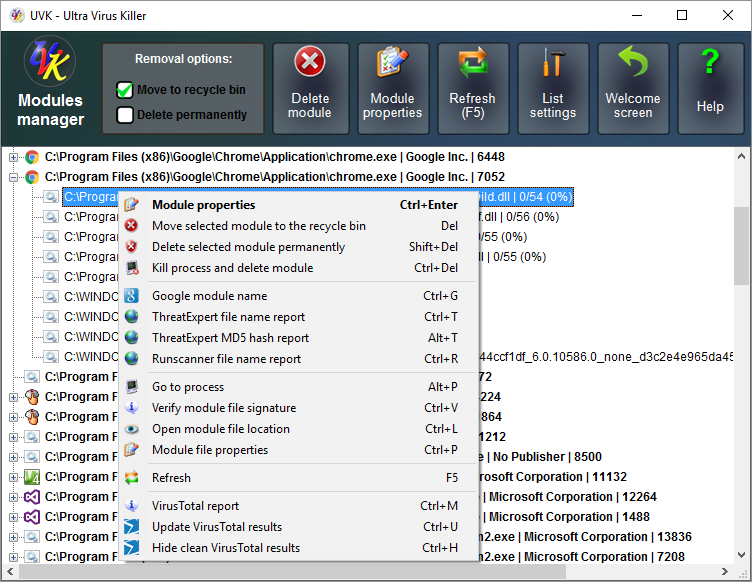 You can choose to move the selected module to the recycle bin, or delete it permanently by checking the desired option in the Deletion options area, in the upper pane. Move to recycle bin: The selected module will be moved to the recycle bin. If UVK does not succeed to move the module immediately, it will be blocked and scheduled to be recycled the next system reboot. This is the recommended option, as it allows the quick recovery of the file, in case of mistake. Delete permanently: If you choose this option, the selected file will be permanently deleted. If UVK does not succeed to delete the file immediately, it will be marked for removal on reboot. This method can be more effective for stubborn files, but it does not allow the recovery of the module file. Use the other options in the context menu to get more information on the selected modules. Click Refresh to update the process and modules list. Click Home or press Esc to go back to the welcome screen.